The findings, to be published 16th January in Nature Communications, came after two successive symmetry-breaking phase transitions at Aalto University's Low Temperature Laboratory. When confined to a nano-structured volume, researchers can use superfluid phases of the isotope helium-3 to study effects like half-quantum vortices—whirlpools in the superfluid where the amount of helium flowing is strictly controlled by the rules of quantum physics. 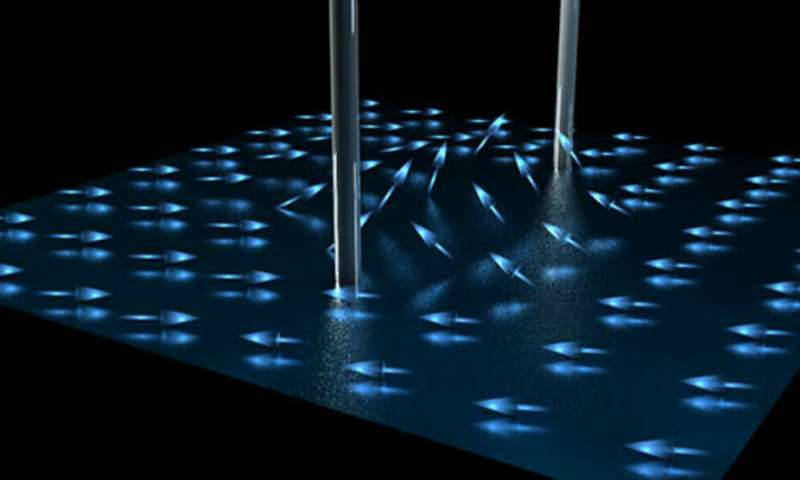 "We initially thought that the half-quantum vortices would disappear when we lowered the temperature. It turns out that they [half-quantum vortices] actually survive as the helium-3 sample is cooled below half a millikelvin—instead a nontopological wall appears," says Jere Mäkinen, lead author of the study and doctoral student at Aalto University. As a bonus, the structure of these hurricane-like defects Mäkinen created in the laboratory also provides a potential model for the study of topological quantum computing. "While liquid helium-3 would be too hard and expensive to maintain as a material for a working computer, it give us a working model to study phenomena that could be used in more accessible future materials," he says.